One of Laurie Patterson’s favorite tasks as an associate professor of computer science at UNCW is working with non-majors. For her, helping a student outside the computer science program learn the value of computers is part of what makes her job so rewarding. But as chair of the computer science department, her students are typically well-versed in technology. Patterson grew up with seven siblings in a small town in southwestern Minnesota. She attended the University of Minnesota, graduating with a bachelor’s degree in biology. For a while she pursued her love of animals and worked for the U.S. Fish and Wildlife Service. But she eventually went back to school to earn her master’s degree in education in training and development using technology. After moving to North Carolina, Patterson pursued her doctorate at Florida-based Nova Southeastern University. The program allowed her to work remotely while traveling to Virginia, Florida and Arizona to attend face-to-face classes. She earned her doctorate in education in 2005. Patterson’s love for tech uniquely informs her profession. 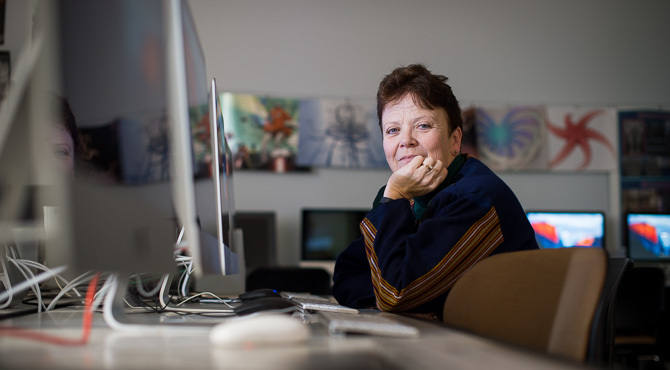 In her position at UNCW, she oversees the computer science program as it develops ideas from concept to implementation. It gives her the perfect excuse to explore a variety of new technologies and think up ways that it can be used. For Patterson, maintaining her sanity involves an early morning run. If she’s not tinkering with some new technology, she is at home repairing and updating her house or out exploring new Wilmington restaurants with her friends and family. Patterson’s plans for the future involve even more development and program expansion. She’s excited about the new M.S. in Data Science degree, which will be offered for the first time in fall 2017. UNCW’s computer science and mathematics and statistics departments created the program with feedback from the business community. Developing academic programs that address regional business needs is part of UNCW’s Strategic Plan. But digital science can also be used in creative fields, and UNCW is exploring options there, as well.